Considering some say we may get a retro series next and maybe go back to Fiveman after Gao; have you looked that up or are you just concentrating on Hurricaneger? There’s theories online, and it seems less than scrupulous. I see that Scream Factory has addressed the issue on the 30th of October, but things might not have completely been resolved by now. I preordered Jetman from them since I could get it two weeks early, but an issue caused them to end up shipping it to me during the week of the general release date. They had a Black Friday sale last month, and I took advantage of it to order something that had been out since August 7th, and there were no delays with it. Then again, it's something that had already been out for a while, even though there are no longer any listings for it anywhere else. It has one on Amazon, but Amazon isn't selling it directly. I've seen people talk about ordering Digimon Adventure tri: Future from them, but still not getting it. I got mine from Best Buy. I tried initiating a store pickup, and this one store that I came up stating they had it didn't have any on its shelf, and for some reason, they kept transferring my store pickup request to a store that didn't show up indicating they had it stocked. I went in there anyway, and they only had one copy on the shelf. So I bought that one copy. Another store that didn't come up in the store pickup search also had just one copy on their shelf when I went there. At least it seems like you can order a copy from their site. As for Digimon Adventure tri. : 6 -Film Collection, Shout! Factory's listing says that it won't be shipping until next week, which has always been the scheduled release week anyway. So I hope they make good on that. The only other release looking forward to from them is their release of The Craft, a Scream Factory release which is scheduled for March 12th. So hopefully things will be back on track for them by then, although I'd rather order that from somewhere else. In the case that this in reference to me and how I mentioned searching Hurricanger on Amazon, it would have been helpful if you quoted my post since your post is three posts apart from mine. I have only been doing Hurricanger searches. I realize that there's a chance that they could do more pre-Zyuranger releases, but until they announce their next one, there's no telling what pattern they're going by. there is a chance that because of the whole hasbro thing there might be a delay in announcements for the next film. Awesome news. Made my day. Yes!! Gonna get it! My favorite Ninja Sentai series along with Kakuranger! Also, for those interested, Shout has a 15% off sale going on right now. It knocked $7.20 off the price at checkout. Preorders aren't supposed to be eligible for the sale, but for some reason, the discount factors out in your cart. So I took advantage of it too. You still have to pay for shipping though. I just hope they've solved their problems with delays by the time it's due for release. 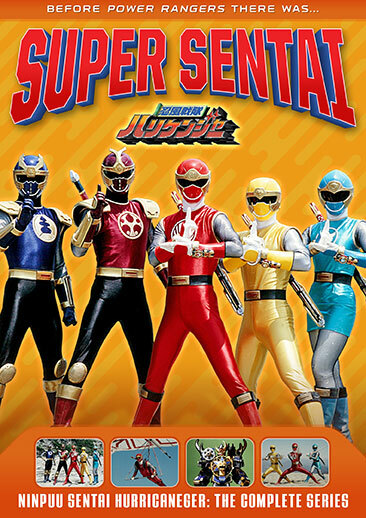 So it looks like we could get at least four Sentai next year. The latter could be Magiranger unless they put out one or two pre-Zyuranger Sentai next year. They heard our Christmas wish! Surprised the Gouraiger are on the cover but...their "turn" is only about a third of the season anyway. I love the series, I'm happy about the announcement but I really don't like the cover art, way too much orange/yellow. Hurricane Yellow almost disappears in the background, it feels off, the background is also just another random pattern. They had some really nice cover arts (Gingaman and GoGo V were the best imo) so I'm not sure why they made this choice. Does anyone have know the sales of the dvd sets? Im just curious. We don't know the exact sales but they announced the twelfth release, so they can't be awful. If you pre-ordered Gao from Shout Factory, they're starting to ship. Got my confirmation earlier. The series that inspired Power Rangers Supersonic! Just not the ones who might have wanted Fiveman or whatever, but there's always next year. Probably as early as June. When that comes, the first episode I'll be watching is episode 10. See if you can guess why. I love the series, I'm happy about the announcement but I really don't like the cover art, way too much orange/yellow. I'm not too big on the coloring right now, but I'm sure I'll get over it. Since the discount price for Hurricanger actually worked, I placed the order. Then I decided to cancel the order and reorder it along with Gaoranger so I can get free shipping. So the Gaoranger portion is currently in the processing stage. Hopefully it'll all go through and be finalized tomorrow, and then they can ship it. If we both get our orders shipped, we'll be fortunate since like I said earlier, people have been complaining about their orders not getting shipped. There's also the matter in having our Gaoranger sets arrive without damage. Oh thank god. I'd started to worry the Hasbro thing may of actually been putting a damper on the DVDs. Hurricaneger feels like kind of a turning point. It was the first show that I remember as having a major RB presence, and marked the beginning of a hit streak for Sentai in general. Plus Toei still loves it to this day, obviously. Yeah, it's a real test of revenge for Fumiya, especially in the larger context of the Hoshikawa parents... oh, you mean episode 10 of Abaranger.